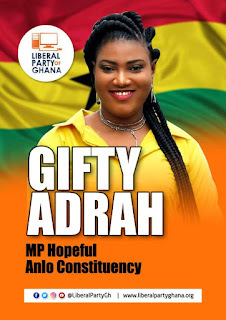 An Aspiring Member of Parliament for the Anlo Constituency in the Volta Region for the 2020 General Election, Gifty Adrah has declared her intention in contesting the seat of government. According to her, her decision to run for the position in the name of Liberal Party is to help strategies, help put Ghana first on the world map and as well assemble the best team of people to work with her shape the Constituency. While admitting the task is an arduous one, she believes it is possible as there are many Ghanaians who are tired with the status quo of how governance has been done over the years between the two entrenched political parties, the NPP and the NDC. “I am here to put Ghana first because Ghana deserves better! Because you deserve better! Because we deserve better,” - she said in a facebook post. “Our generation is a bridge – the only remaining bridge between the truncated dreams of our forebears and the eager hopes of posterity unborn. We have no choice but to disrupt every faulty status quo to make Ghana and the Anlo area work for all of us. It is a grave burden that will demand more from all of us collectively. God has indeed blessed our homeland Ghana. It is we, who must now make her Great and Strong,” - the renowned filmmaker disclosed. Gifty further said, she hopes to position Ghana where it belongs in the community and thus called on the youth to rally behind her to create a fitting inheritance for future generation. “In a nutshell it is not about getting people who have been in politics for long and shouted the most. That is not us. That is not me. That is not how I want to do this. We want to say there is an art to doing politics and let us do that art.